Waxing is an excellent addition to any treatment menu, providing repeat business as it is an essential maintenance option for many clients. The Guild Accredited Waxing Course meets the Habia National Occupational Standards and covers the various types of hair removal, anatomy and physiology, skin disorders and diseases, contra-actions and contra-indications, reception, consultation, ventilation, technique, male waxing and aftercare. This Guild Accredited Waxing Course also includes the Guild Professional Standards course for students who have not previously completed this course. Intimate waxing is an advanced treatment which will allow you to put yourself one step ahead of the competition. Specialists in intimate procedures can become popular with loyal customers who trust their therapist. The Guild Accredited Female Intimate Waxing course is perfect for students who have already completed a waxing course and are looking to build on these already acquired skills. This course will teach you everything you need to know in order to carry out a professional intimate waxing treatment on a female client. The theory is completed at home in your own time before a one day practical assessment at The Beauty Cabin Academy. The Guild Accredited Female Intimate Waxing course includes the Guild Professional Standards course, usually priced at £99 + VAT, for all students who have yet to complete this course. The course is fully accredited by the Guild of Beauty Therapists, the UK’s leading professional beauty trade body, for membership and insurance purposes. Upon completion of the course, students will receive a full-colour certificate for the Guild Award in Female Intimate Waxing. This course covers the technique for performing a superficial and deep cleanse, tone, steam, extract, massage, mask and moisturisation. The Guild Accredited Facial Treatment course follows the National Occupational Standards and covers reception, consultation and ventilation. It also covers anatomy and physiology, contra-indications and contra-actions, skin conditions, skin analysis, preparation, skin types and product selection, preparing for treatment, technique and aftercare. The Guild Accredited Facial Treatment course includes the Guild Professional Standards course, which is usually priced at £99 + VAT, for all students who have not completed this course. You will also complete a one day practical assessment at The Beauty Cabin Academy. You will have the opportunity to practice the routine on friends and family before being assessed by our experienced tutors. On completion of the course, successful students will receive a Guild Accredited Facial certificate. This Guild Accredited course follows the National Occupational Standards and covers reception, consultation and ventilation. It also covers anatomy & physiology, contra-indications and contra-actions, skin conditions, preparing for treatment and the techniques for eyebrow shaping, the tinting of eyelashes and eyebrows and the application of artificial lashes. 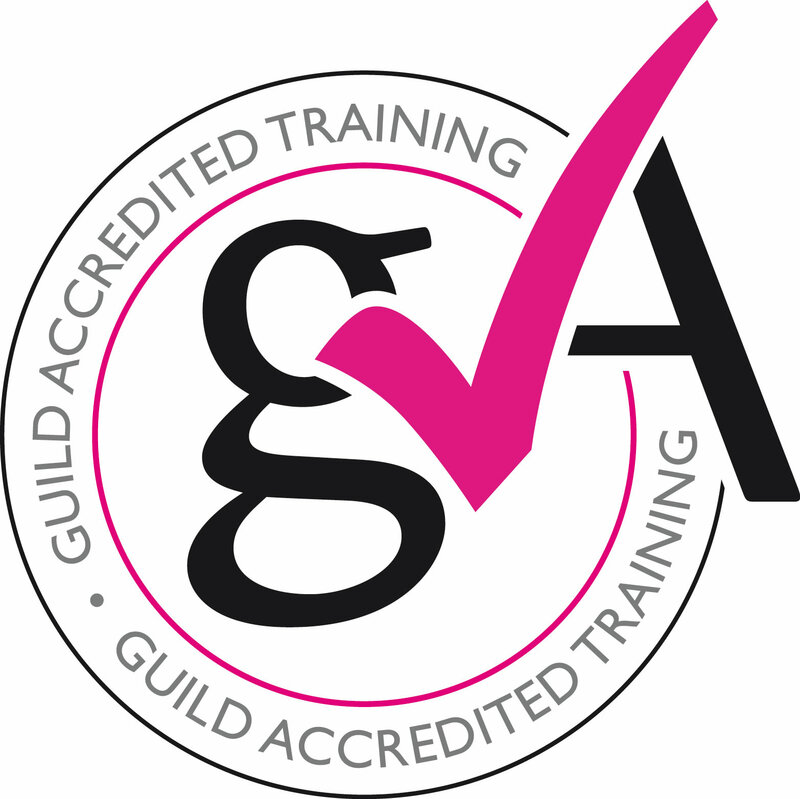 This Guild Accredited course includes the Guild Professional Standards course FREE of charge this is usually priced at £99 + VAT. This Award is accredited by the Guild of Beauty Therapists, the UK’s leading professional beauty trade body. You will also complete a one day practical assessment at The Beauty Cabin Academy. On completion of the course, successful students will receive the Guild Accredited certificate in Lash & Brow treatments which is acceptable for insurance purposes with The Guild of Beauty Therapists. The Eyelash Extensions course includes the Guild Professional Standards course free of charge. The Professional Standards course is usually priced at £99 + VAT. You will also complete a one day practical assessment at The Beauty Cabin Academy. On completion of the course, successful students will receive the Guild Accredited certificate in Eyelash Extensions which is acceptable for insurance purposes with The Guild of Beauty Therapists. This Guild Accredited Spray Tanning course follows the National Occupational Standards and covers reception, consultation and ventilation. It also covers anatomy & physiology, contra-indications and contra-actions, skin types, preparing for treatment, technique and aftercare. The Guild Accredited Spray Tanning course includes the Guild Professional Standards course, usually priced at £99 + VAT, for all students who have not completed this course. The course is beautifully written and accompanied by images and a voice-over. Upon completion of the online theory modules, you will receive a PDF manual which you can refer back to. Eight of the modules and examinations are completed online with full online support available. You will also complete a half day practical assessment at The Beauty Cabin Academy. You will have the opportunity to practice the routine on friends and family before being assessed by our experienced tutors.. On completion of the course, successful students will receive the Guild Accredited Spray Tanning certificate.